(HARRINGTON, DELAWARE) – January 11, 2018 – Mark Collins of Sussex County had the state’s top 2017 soybean yield with 84.55 bushels per acre of full season soybeans. Collins planted Pioneer P41T65PR, a Plenish bean, which produces high-oleic soybean oil. 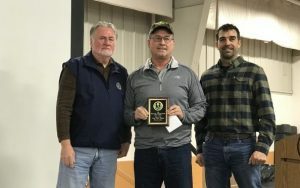 Collins received $1,000 for highest yield in the full season category and an additional $500 for the state’s top yield. 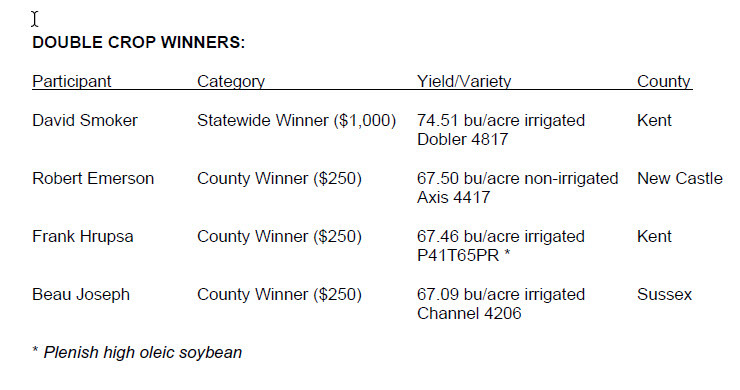 David Smoker of Kent County won the statewide double crop competition with 74.51 bushels per acre. Smoker planted Dobler 4817. As state winners, Smoker received $1,000 for highest in the double crop category. 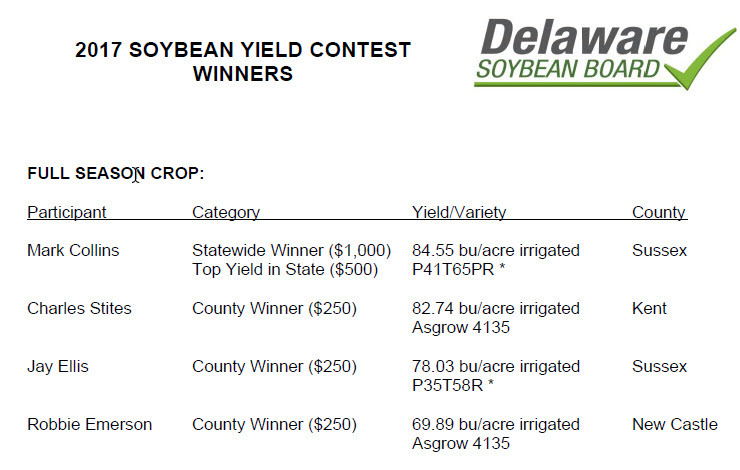 The Delaware Soybean Yield Contest was created by the Delaware Soybean Board to gather data on practices incorporated in producing high soybean yields while recognizing the individuals who have achieved such yields. 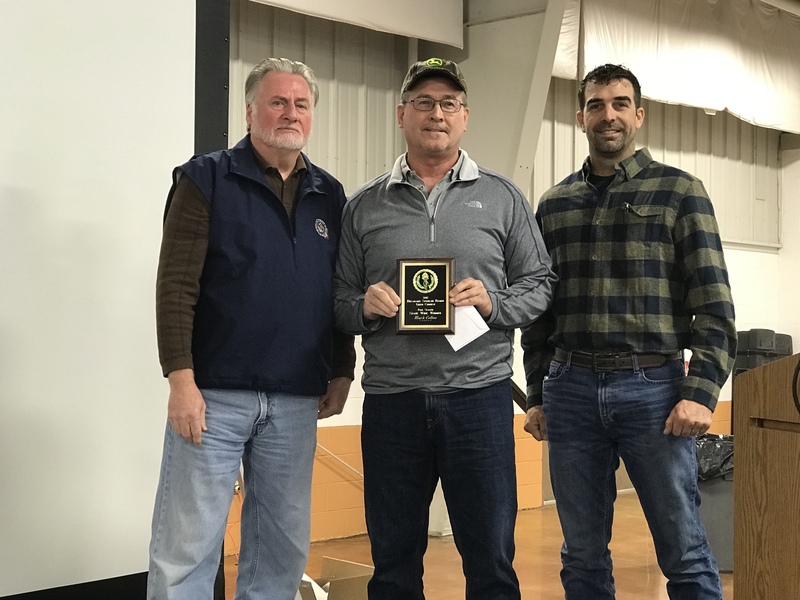 The awards were announced by Delaware Soybean Board chairman James “Jay” Baxter, a farmer from Georgetown during Agronomy Day at Delaware Ag Week in Harrington. County level winners received $250.Winners for full season soybeans included Charles Stites of Kent County with 82.74 bushels per acre; Jay Ellis of Sussex County with 78.03 bushels per acre; and Robbie Emerson of New Castle County with 69.89 bushels per acre. 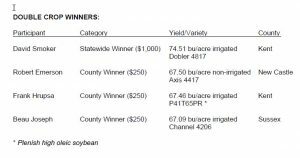 County winners for double crop beans included Robert Emerson of New Castle County with 67.50 bushels per acre, winning with the only non-irrigated entry; Frank Hrupsa of Kent County with 67.46 bushels per acre; and Beau Joseph of Sussex County with 67.09 bushels per acre.